This topic contains 17 replies, has 13,836 voices, and was last updated by Boss Meri 2 years, 10 months ago. If you have trekked with Kokoda Trekking and you fit into this age category, please post here as it would be very much appreciated so that other potential trekkers can read your honest comments. To post, you first have to register. Once you have completed your registration you can log in and post your comments by clicking on the 'Add Reply' button; type your testimonial and then click the 'Add Reply' button. At this point, your message will be uploaded onto our website. 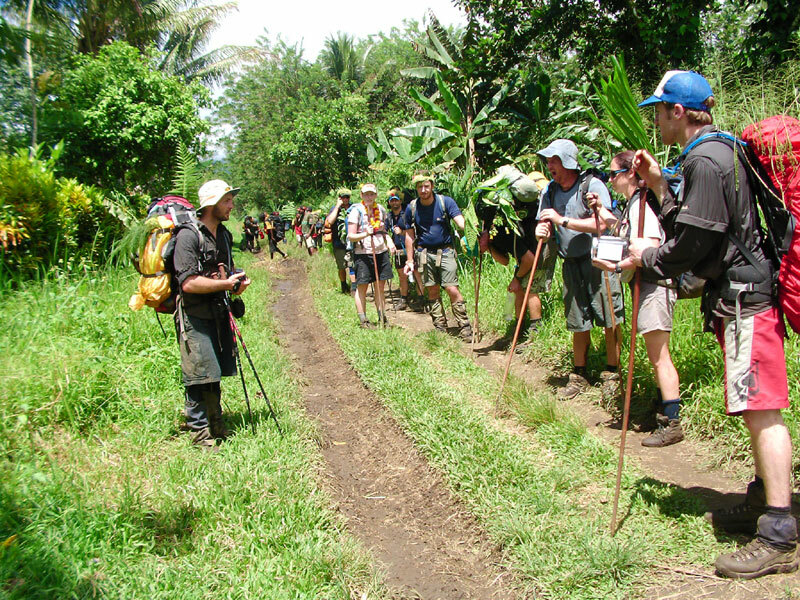 Wherever, possible please state your trek number and date that you walked with Kokoda Trekking Ltd (KTL). The entire experience was absolutely amazing. All the guides and porters did an amazing job in ensuring we were all safe and enjoyed our 8 days. 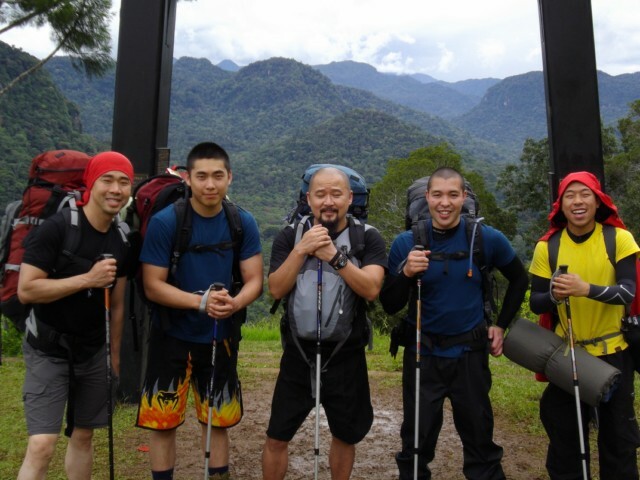 All of our trekkers noted that the guides from other companies were not as animated or happy as our KTL boys. At all times, the trekkers felt safe, supported and cared for on our trek. Whenever we needed help, water or just a quiet word the boys were always there. We cannot speak highly enough of the job ALL the boys did. Gosh!, Where do I begin! Firstly, Gail, I would like to extend our thanks to you and Russell for your absolute professionalism from our first enquiries into doing Kokoda to the completion of it. You (KTL) covered every possible need while remaining absolutely flexible with all our requests – thank you. The Kokoda Track far exceeded any expectation I had considered, physically and psychologically and I began to realise by about the third day, that it becomes less and less about the Kokoda campaign and more about the struggles you face within yourself (although due respect and acknowledgement should be given to the diggers). 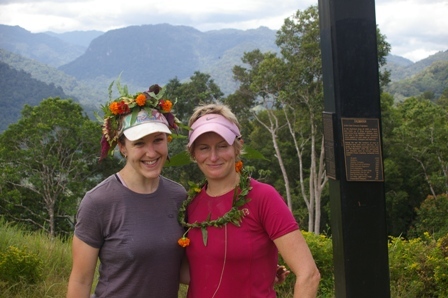 Kokoda forces you to go beyond all boundaries, limitations you set for yourself and pushes you right to the very end of your trek – I personally am taking with me so much more than just a difficult hike! As for our three beautiful angels, Tony, Roland and Waima, these are some of the most warm-hearted, humble and gentlemen I have EVER encountered in my life. We came together as strangers but are leaving as friends. I have learned so much by watching and listening to these guys – Tony with his wonderful insight into life (always good campfire conversations), Roland and his ever present smile and wonderful voice – sort of a father figure on this trip – knowledgable and protective) and Waima, the shy guy in the group but always made me smile with his cheeky grin and great sense of humour (extremely motivated man). 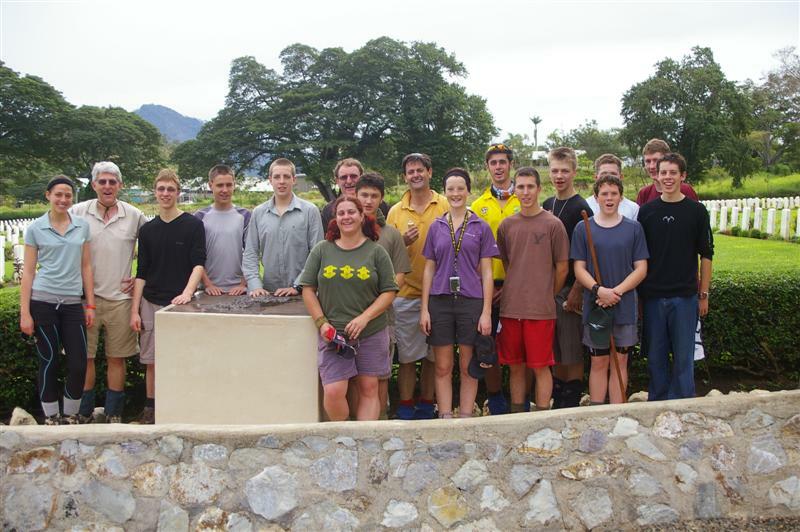 Without these guys, Kokoda would not have been the same. Gail, in summary, this was by far the best trip of my life and I really do owe it to yourself, the company, but especially Tony, Roland and Waima. I leave a piece of my heart, my spirit with them – until next time! 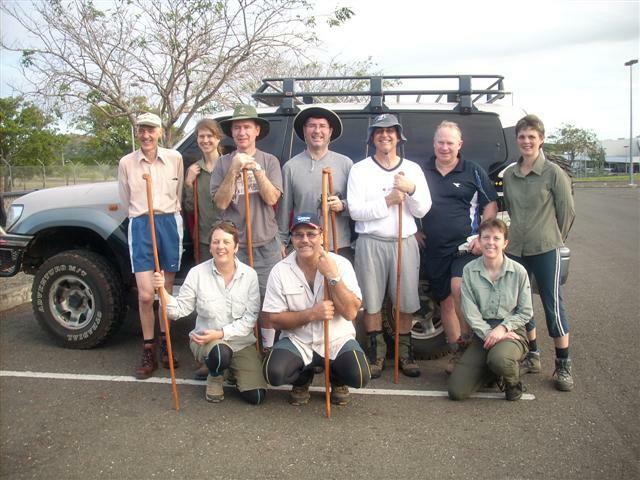 By the way, if I do come back to do Kokoda again – I would love to be able to trek with these guys again. Thank you for a truly life-changing experience. Thank you to all the boys, we could not have made it without you. Very happy, very tired, very proud! G'Day Potential and Return Trekkers!! Firstly I would like to thank CAPT(AAC) Laurie Hawthorne and Gail for their tremendous effort in organising so far not one, but two treks for our Army Cadets of NSW. Without the initiative from Laurie and the endless phone calls between him and Gail, our treks would not have got off the ground. Thank you both. Luckily, I had decided to hire a porter: even though I had been teased at home about not carrying my own gear..I felt I would appreciate the surroundings more – not just look at my feet – and be able to keep up with the teenagers better . My porter turned out to be guitar guru and singing specialist Freddy Yauga. He made me feel right at home and liked to have a joke and a laugh (lots of laughing) as we walked along. I would often get to the top of another 'incline' and he would be seated either playing his guitar and singing or waiting patiently with a big grin. Somehow though, he always seemed to be right by my side when I needed a helping hand or when a creek crossing was imminent or when we went down the really steep descents…I was happy to say that even though I was the only one who admitted before we left that I would need a porter – everyone on that Trek (except Stan) 'borrowed' one of the boys as a porter for at least some of the time. Thank you Gail for thinking ahead and providing porters for the under 16 year olds. Freddy wasn't the only one of the KTL boys who were happy to help – all of the boys have easy going natures and were ready to lend a hand at every turn. There was never a problem too big or small, and everything was always with a smile. You felt like family from Day One. 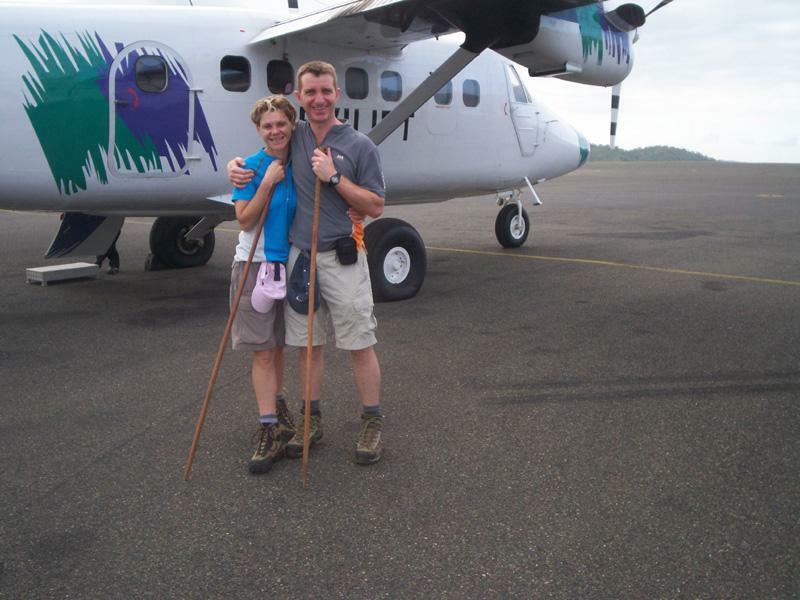 Our Trek Guide David Clark Embo was always checking that everyone was OK and was especially resourceful when an unexpected injury (blisters to both big toes) affected one of our Officers (Jim Read) and the decision needed to be made whether to be airlifted out. The boys had got so attached to Jim, they offered to make a chair on which they would carry Jim to the end of the Track!! Our Trek this year (Trek 488) was an interesting trek with a new bunch of teenage cadets. Laurie came on this one and his journey was marred by the onset of severe knee problems on Day Two. He battled on with both knees busted and I was impressed by his determination to complete the Track. I struggled more this year, as I also had a knee problem, but it was not enough to stop me from enjoying the experience and learning more about myself and my levels of endurance. Both Treks brought home to me some of the struggles our Diggers must have had during the Kokoda Campaign and even after a second Trek, I have no idea how those amazing Diggers fought a war in that terrain. We were pushing ourselves just to cope with the mountains and the high humidity; we didn't have to cope with 1/2 a blanket during the cold nights, dysentery, little or no food at times, as well as being shot at, dragging huge guns behind us, coping with injuries of all kinds and continuing on with the fight. I am forever grateful to those soldiers who fought along the Kokoda Track and also to the continued efforts of our current Defence personnel. I thank Gail and Russell and the boys for two consecutive years of brilliant Treks with the Army Cadets. I thank the boys who gave personal insights into the Papuan side of the Campaign supported with readings from Bill James' field guide to the Kokoda Track (recommend read this before you go!) and tales from their grandparents service as we moved through the battlefields. The boys are an absolute credit to KTL and to their families and I rave about KTL to anyone who will listen here in Australia. I look forward to next year's adventure!! Hi Gail, I would like to thank you and your team for making my trek a wonderful experience. I have been home for now two weeks, I often listen to the CD which brings back many good memories from my recent trek. Can you please pass my thanks and appreciation to Rod Ori ( the great leader), Wallace Lemeki and Andrew Yauga (their assistants) for their hospitality during the trek which contributed to the great time I had. Also to Freddy Yauga my personal porter who was just wonderful and without him I believe that I probably would not have made it, he was caring and alot of fun to walk with. Maybe next year I might return with a group of friends who are keen to do the trek, we are just waiting till you put more dates on the web site for June/July to decide which trek to do. Editors Note: True to her word, Catherine is about to return with some friends to commence their walk on the 3rd August, 2009!!! Hi Gail, I just wanted to say thank you for a great holiday – it was my favourite hiking experience ever! I just wanted to say thankyou for the amazing experience I had on the track. I am so pleased I trekked with you, speaking to fellow trekkers along the track from different companies, I feel I was with the best company which also suited me . Firstly I preferred that I was able to carry my own gear. At the end of the many hard days, my own small comforts and belongings were important. Before I had considered setting anything up, my porter was there to help. All the boys were there when any of us needed a hand, whether we hired a porter or not. My porter, Alex was always by my side and I enjoyed the fun and silly times with him and all the other boys on the track. They made me feel welcome and safe. The fact that we could also go at our own pace was unreal because it meant I could stop to rest or ask questions about the landscape or wildlife at anytime. I felt I got the most out of my time. I would also like to thank you on your local knowledge on how the road out of Owens Cnr reacts to heavy rain. having to walk hours along a dirt track or to camp on the side of the road because my bus was bogged would have crushed me and I would not have been a pleasent person to be around. You picked us up in you 4WD and got us out comfortably to continue our adventures. Thank you, I'll be sure to walk with you again. Guys, you were awesome ! Guys just wondering if I could thank you all for the best adventure of my life!!! I don't think I could have chosen a better "holiday" for my first overseas trip! The porters were the most hospitable people I've ever met, I really felt I was great mates with alot of them and I'd love to give a special mention to my personal porter and my best mate for 10 days, Ricky. His knowledge about the military history was fantastic and he was very talkative, friendly and he taught me alot about the culture including the language, the other boys got a real kick outta that! Actually so did the locals when they met some white boy and his half-assed attempt chat to them in motu! I could go on all day about how great this adventure was, how great the other trekkers were and how fun it was staying with the villages and mucking around with the kids so knowing how busy you are I'll leave it there. One more thing I apologise to Gail, I couldn't tell you face to face about how great this really was, I got really sick on the last day and by the time we got to Owers Corner I could barely move or stay awake, but I'm better now and I've been wearing my kokoda trekking shirt everywhere, including the Gold Coast Marathon, lots of people are showing interest! Okay I promise I'll go now, thanks again and I should see you guys again in a couple of years time. To Ricky your an absolute legend mate, good luck with your schooling and whatever pops up in the future! 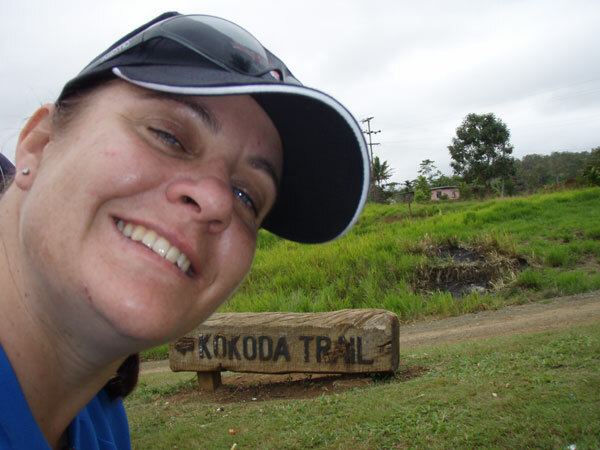 Hi Gail, I had an amazing time on the Kokoda Track, and would like to thank you and your team at KTL for making this such a memorable life experience. The guys were amazing. I can't believe that Brendan can do the track in 16 and a half hours! I was completely tired after doing it in just over 6 days. I spoke to him a fair bit about the way that he trains for it etc. He very matter-of-factly told us that his strategy was pretty much to run the "easy" bits and walk quickly in the "hard" bits. 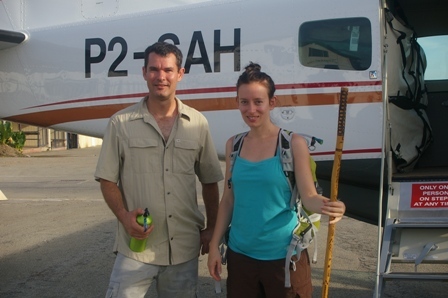 I hope that Andrew enjoyed his first ever trek and Port Moresby experience. We really enjoyed having him with us, and he's really good at lending a helping hand. There were a few steep descents where he spotted me in trouble and didn't hesitate to hold my hand the rest of the way down. Cyprian (Master of the Ukelale!) was also a great help. I was a bit (fair bit!) slower than Kim, and I spent some time carefully watching Cyprian's red shoes so that I knew where to place my feet. He was really good at making sure I followed, and slowed down to match my speed. I'm a nervous down hill goer, so I really appreciated it. By the end, I felt like I had 5 personal porters….I'm sounding like a broken record….but they are truly amazing. Dudley was a fantastic guide…I really enjoyed chatting to him and he was also there to lend a helping hand. If you could pass on my thanks again to the guys, I would appreciate it… Brendan suggested that my husband (Mark) should now be challenged to do the track…I'm still working on it, but if he ever does, I'd want him to go with this team of guys. Our Trek in June July School Holidays of 2007 was my first time on the famous Track and I was very nervous. 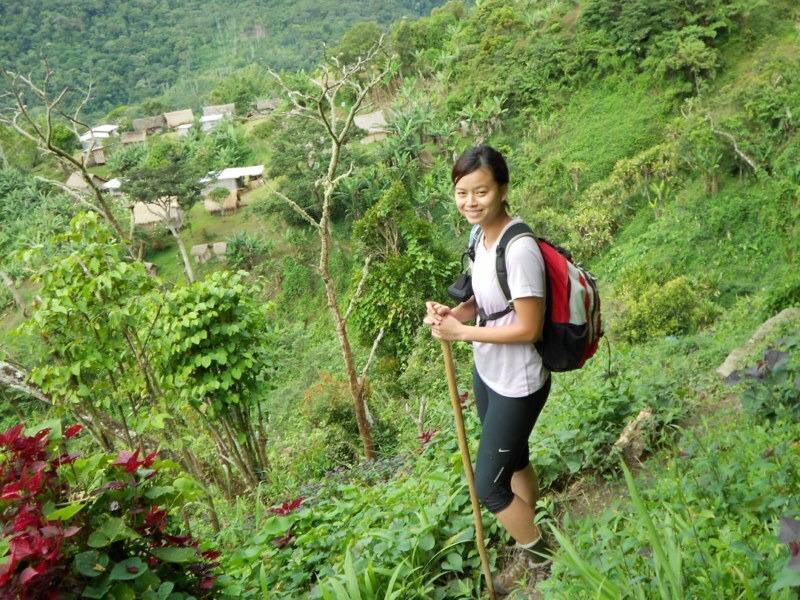 Although I walk a lot for work at home, our town is very flat and it was difficult to find suitable training spots to prepare for what had been described to me as 'walking up and down stairs, in sticky mud for up to 10 hours at a time, in hot humid conditions…'. As I looked towards our start point at Owers Corner from Bomana War Cemetery that first overcast day, I was fairly concerned that my back stairs training was not going to be enough..
Another example for me was … I was washing the mud from my feet/shoes and along came John who had fetch some water and proceeded to wash my feet (which I would not allow) but the act in itself had touched me. It was rare to receive such kindness/generosity, what impressed me was that they did not expect anything in return, they felt it was part of their job to look after us… that's going above and beyond the call of duty…. 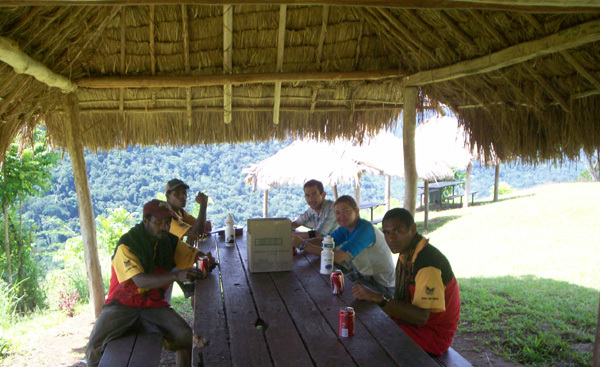 Kokoda Trekking should be proud to have such great employees working them. 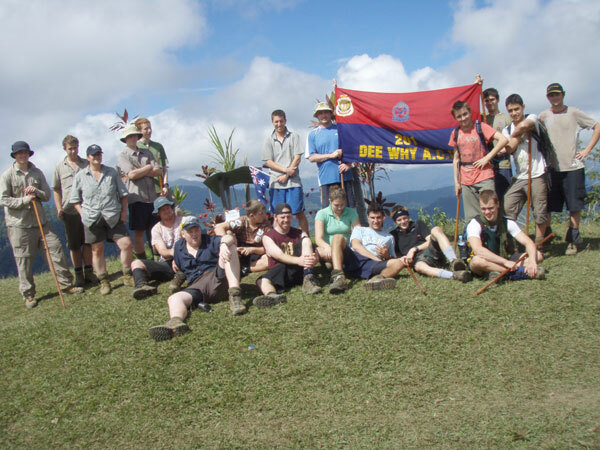 I am sure there are more examples the boys could share but all I can say on behalf of the "All Asian trekking team" a huge THANK YOU to Kokoda Trekking Company and the Trekkers i.e. Harold Hauro, Kingsley Boropi, John and the young boy (Killer). 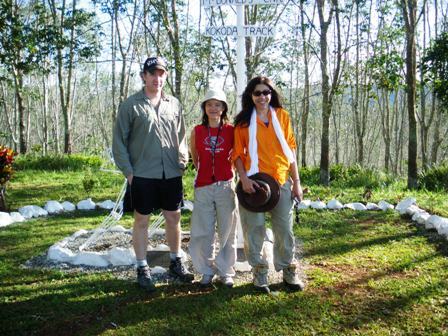 We will never forget the experiences we had at Kokoda and the team for ensuring our safe return. PS Please let Harold and his team know that we had an awesome time and thank them for their outstanding service and we wish them all the very best! Jeremy will be coming back (with a bigger Asian group in the coming years) and their services will be called upon. Hi everyone. Thanks for all the well wishes. I can't believe I survived. It was the hardest physical challenge I've done in my life. But the feeling of finishing cannot be described. I have so much respect for the Australians that fought on that trecherous path. I also have more appreciation for the PNG locals that helped me through it. For all who are considering, just book and lock it in! just wanted to get in touch to say thank you again, not just for the amazing experience but also for opening your home to Danny and I, everyone I tell my stories to here are surprised when I say I stayed in the companys' owners own home, you cant ask for that kind of consideration. It's been good to come home, and im loving the hot showers and flushing toilets still (lol) but I loved every second of my trip, fron the time my plane landed in Port Moresby to when my plane landed in Melbourne, and you and Shane helped make it that much more incredible, as well as Kingsley, Slimi, Tony and Athinsis. Please give them all our love and thanks again for everything they did for us on the track next time you see them, and tell them all my family and friends are hearing how wonderful they, and you were, to us. Thank you, thank you, thank you for making my first trip overseas a truly unforgettable experience.